Lives are made up of tiny steps. Some are chosen for us; some we choose. All hold the power to change who we become—but only if we let them. After devouring From a Distance, the first book in the Timber Ridge Reflections Series, I eagerly picked up the second book in the series. I had really come to like James when he was introduced in the first book. So I was eager to see how his love story played out. Dr. Molly Whitcomb was was not quite what I expected for James. In truth I liked Molly enough not to object to her romance with James, but I felt something wasn't quite right. I guess when it comes down to it, the fact that Molly lied - yes, she had good reason and it was something she regretted right from the outset - but it makes me dislike her no matter her reasons. For this reason, I struggled to truly sympathise with her. For me though, the true stand out in this book is James McPherson. He's a man you want to look up to, someone who you can depend on. I really loved his patience, his quiet reflections and his ability to remain clam in almost all situations. Yet he is not afraid to step out in faith when God requires it of him. In short, he is perfectly suited to the role of Sheriff for Timber Ridge. Again Tamera brings the beautiful Colorado mountains to life. I found myself wishing I lived in Timber Ridge just so I could see these beautiful sights when it was still largely untouched.A great read with a compelling romance. 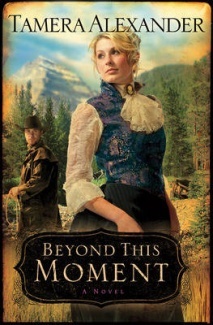 Stay tuned for next week's review of Within My Heart the final in the Timber Ridge Series.